I love easy to make versatile recipes and these oven/barbecued chicken wings are just that. 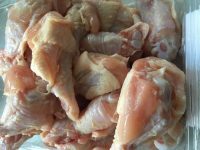 This easy chicken wing recipe is delicious, the sugar and spice flavourings are unusual and the wings can be baked in the oven or cooked on the barbecued. 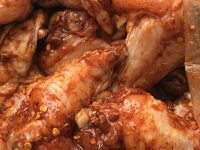 The wings can be enjoyed watching sports with friends, they make a quick and easy midweek family meal or are a wonderful addition to a BBQ/braai for friends. I make them for my family in the depths of winter, I serve my sunshine on a plate meals on the coldest days tricking the brain, with the help of central heating and the BBQ style meal, into making it feel like a summer’s day. My son Harry’s BBQ sauce (monkey gland sauce for my South African readers) is delicious and I often use that as the marinade for chicken pieces. But these Sugar and Spice chicken wings are a little different and very addictive. As with all my recipes you can customise them to your own taste, tweak the heat by increasing or decreasing the cayenne pepper and chilli to taste. The recipe can easily be halved, I have made 3x 475g packets of wings, as my family loves them and they keep well for a lunch box or snack the next day. Although I have called them sugar and spice the main flavour you taste is the chilli, then the cumin and the last flavour you are left with is a slight sweetness. So although the sugar is listed first that is not the dominant flavour. Chicken wings are economical and delicious whether you are melting in the Southern Hemisphere sun or needing a sunshine on a plate meal in winter. I hope you make a tray of these wings. When you do please send me a note or photo and tell me what you thought. 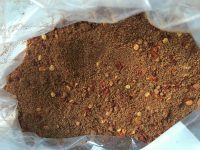 Delicious Chicken Wing Rub a versatile tasty and easy recipe to have waiting for you when you rush in from work, great on a BBQ and loved as a sports watching picky snack. If cooking straight away pre-heat the oven to 200 degrees. In a plastic bag add the seasoning and mix the herbs, spices and garlic together, making sure there are no sugar lumps (use the back of a teaspoon to press the lumps out of the rub). Add the washed and cleaned chicken wings to the bag of sugar and spice and massage the rub into the wings either with the bag open or closed. It takes longer with a sealed bag but you may not like the feel of raw chicken on your hands. If you have time allow the wings to marinade for 20 minutes or overnight, the longer you leave then the tastier they become. When you are ready to eat tip the contents of the bag onto a lined baking tray with a lip. Bake in a very hot oven for 25-30 minutes or until the wings are golden or they would be delicious cooked over coals or on a gas BBQ. Serve on their own as a snack, with BBQ sides and salad as a meal. I like using the chicken drumlette's (the top part of the wing attached to the breast bone. They are meatier and tend to be cleaner when you buy them so require less preparation. If you buy packets of the whole chicken wings make sure you burn off the feathers with a match or lighter. Hold the flame near the feather and singe the feather off. This is much easier than trying to pluck or cut the feathers off and cut the very tip off leaving only the wing with meat. This recipe works well with pork chops, chicken breasts, chicken pieces and even a whole chicken, just adjust the cooking time according to the instructions on the packet. I hope you make a tray of these wings this weekend and when you do, please send me a note or photo and tell me what you thought.